Every spring, eagle-eyed fashionistas everywhere watch the sneaker market like it’s their stock in Bitcoin. 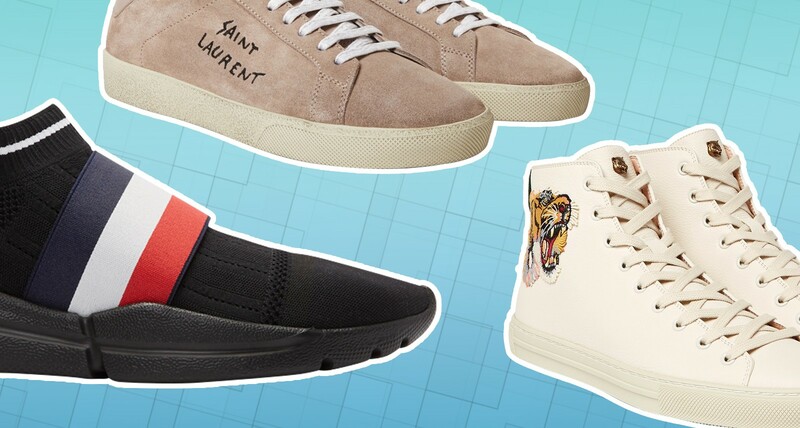 So no, you’re not alone dealing with the sometimes daunting task of finding a new pair of kicks this season, which is only becoming more of a challenge amid the height of the ugly sneaker fashion phase. What is ugly-good and what is ugly-bad? Who can ever be sure with Kanye making the rules? No worries. We’re here to help broker your sneaker investment, and help hedge your bets in the way of making a smart and stylish purchase that will keep appreciating over time. Gucci — the brand personification of a blue chip stock. It’s hard to not look in-the-know wearing Gucci, but these full-grain leather high top sneakers with the house’s signature Bengal tiger motif sewn into the side will also keep things classic to a degree. Everyone’s familiar with the classic Chuck Taylor high-top shape, but Gucci’s inspired take on the design brings the shoe into 2018 with them. For those who’ve never really been a big fan of the way the rubber cap toe on a pair of Chucks curves their toe box up, you’ll be excited like I am that Gucci has foregone that detail for a sharper continuation of the full-grain upper all the way down to the outsole. If you, like Chef from Apocalypse Now, aren’t a huge fan of tigers, perhaps you’ll have an easier time facing your fears here with these clean and uncomplicated black calfskin sneakers by Tiger of Sweden. The lace-up closure and white rubber outsole are simple but understated features that are much appreciated by us in this ever-elaborate sneaker era. The only thing that could go wrong with wearing these is if you order an incorrect size. That, and if you get out of the boat. Never get out of the boat. Hi tiger! Bye tiger! We’ll admit, the word ‘classic’ gets thrown around a lot on menswear blogs. Still, you can never really argue with the adjective getting paired with all-white Nike Air Force 1s. The design has pretty much been an undisputed cult favourite since it’s birth in ’82, and for Nike, it’s a cash-cow product that helps keep them in the black. The AF1s can confidently foot almost any outfit other than the most formal ones, and even that’s been tried numerous times by those trying to push sneaker-and-suit boundaries. White and black are always going to be the most common colours found in the sneaker sector, but a pastel-pink has been gaining popularity in recent years, with big sneaker companies producing big numbers on them. Saint Laurent’s SL/O6 Court Classic is giving us a great suede option here that will look bomb with that light wash denim you’ve been waiting on the sun’s reappearance to wear. And in case you’re afraid nobody will know how hard you’re flexing on ’em with SL shoes, the French brand has taken the liberty of stitching in their highly sought-after name right onto the uppers. This newcomer to the footwear game is done by Oliver Cabell, a brand that previously exclusively created high quality accessories. Oliver Cabell has taken their extreme care and attention in creating accessories to enter the sneakers game, and their first edition of the Low 1 is catching huge heat in the community for a reason. These have to be the cleanest sneakers on the list, but to me are the most exciting. They’ve essentially created a product that looks and feels comparable in style to the holy grail of sneakers, Common Projects, for a fraction of the price. The value in quality for money is unheard of in the sneaker market too, and Oliver Cabell’s complete transparency policy lets you know exactly how their product is made, where it is made, and what materials are used. Use this as some insider info to boost your sneaker game this season. The checkerboard pattern belongs to one sneaker brand and one sneaker brand only. The anarchist, rebellious nature of skating culture has made a big resurgence recently (see: all the Thrasher tees, wide-legged cotton chinos, beanies, and of course, Vans sneakers in your Insta feed). The instantly recognizable checkerboard pattern, especially in the slip-on style, is as trendy now as it’s been in years, so it makes for a great sneaker stock to buy, buy, buy. If you’re in the market for a slip-on, but the Vans checkerboard design just isn’t your aesthetic, Sperry offers this more minimalist approach to the plimsoll. The off-white upper goes well with the navy stripe and white sole for a truly reliable spring sneaker choice. With a very palatable starting price and an even more enticing sale price at the moment, Sperry is usually a good option when you’re looking to average down. It’s almost low enough that if you wanted to, you could just pick up a clean pair of these at the start of every new season instead of cleaning them regularly. While I may be writing this article in 2018, you may already be in 3018. We realize that street style and athleisure have taken off over the last few years, and they look like trends that’ll be here for a while. It’s no coincidence that Italian clothing giant Moncler is testing the waters of one of the most popular menswear genres of today. If you’re committed to going full goth-ninja, you could at least do it wearing Moncler. Another classic design by Vans that has been in the papers a lot recently is the black Old Skool sneaker. I think people had forgotten for a while just how versatile these shoes are, but now you’re seeing them everywhere. Don’t let that deter you from buying them, though. They go with everything and are basically just a sensible purchase if you’re really stressing on getting a sneaker. The black upper is an added bonus if you, like me, take longer than you should between cleaning sessions. Loud graphics and colours have definitely played their part in this nouveau sneaker era. Here we’re dropping the ugly but keeping the loud in terms of design elements from today’s top trending sneakers. Featuring a bright red thunderbolt and snakeskin printed toe and tongue, these sneaks from UK brand Crime London look like they’re straight out of a street style look from London Fashion Week Mens. Although that may sound intimidating and hard to pull off, the sneaks are mostly white with a bit of red and navy blue, and their bones are pretty traditional. A good pair of denim should be all you need to look stylish in them. Steve Aoki: "I Think It’s Really Punk to Have Your Own Fashion Line"